It was a day for Lions. 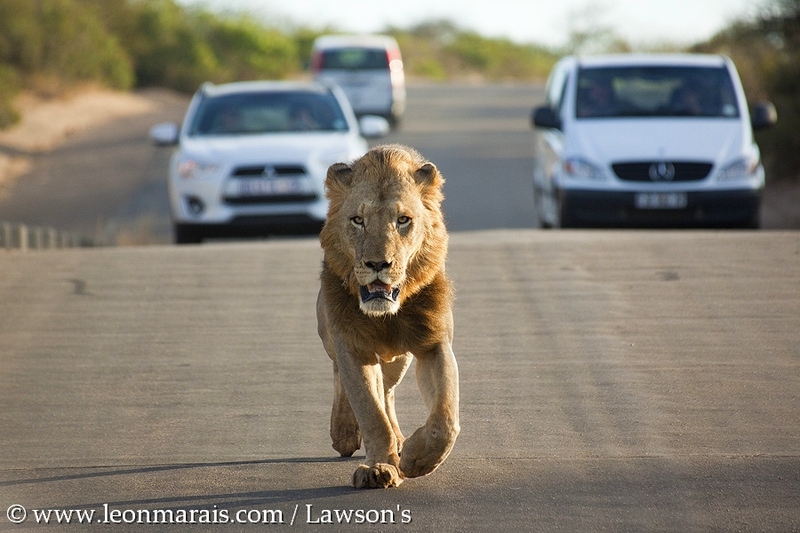 After spending over a week birding in the northern parts of South Africa, including some time in the far northern Kruger National Park, we were ready for some big cat action. 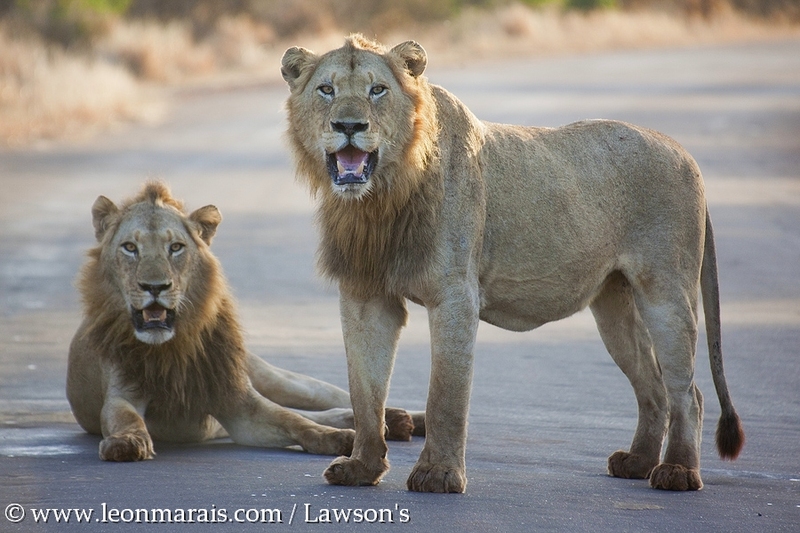 While the advantage of the far northern Kruger is that it is less busy in terms of tourists, it’s also not quite as good for big cats, and on this trip we only started encountering cats when we hit Satara in the south / central region of the park. 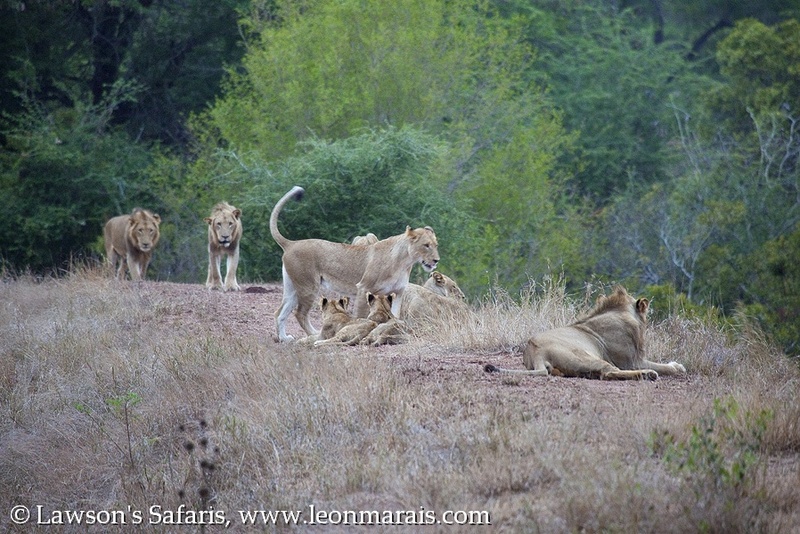 On our first morning drive from Satara we encountered a pride of ten Lions at Nsemani Dam, catching them early in the morning while they were still very active (a sighting of Lions doing something is worth ten sightings of Lions sleeping). 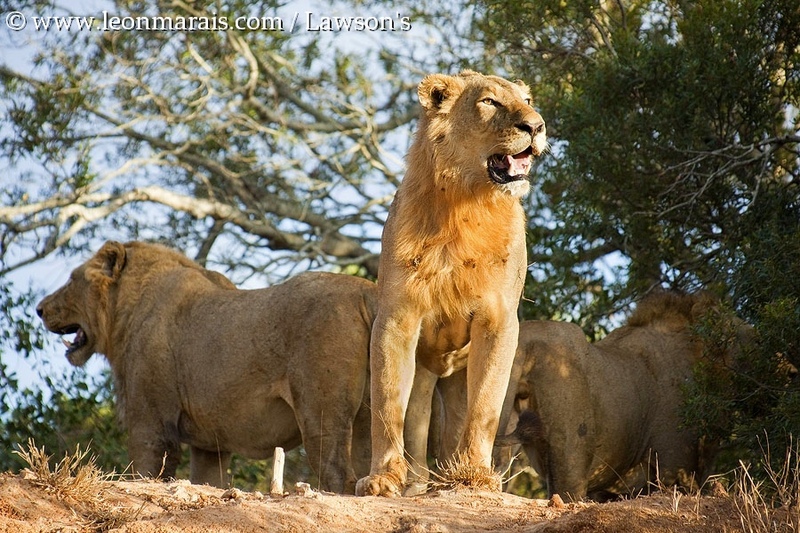 Later on in the morning we encountered a pride of seven at Sweni waterhole, spending some time with them before heading back to camp for breakfast when our stomachs started protesting the hour. And in fact, while we were having our breakfast they killed a Zebra, showing again that if you have the patience to spend a lot of time with animals such as Lions, you will be rewarded with some action eventually. That afternoon we went down to watch the Lions still feeding on the Zebra, and while we were watching them a Pearl-spotted Owlet zipped in to land on a branch in front of us, carrying a freshly caught Little Swift, just another kill to add to the day’s growing tally. That night Alice and Gerard went on a night drive, and saw a third pride of Lions (which we had seen briefly during the day) feeding on another victim, this time a Blue Wildebeest. The next morning was the day we were due to leave the park, and to make the most of it we decided to leave camp as the gates opened and make our way to Tshokwane for breakfast, and from there head south to exit at Phabeni Gate. And thus began the three hours of magical game viewing. 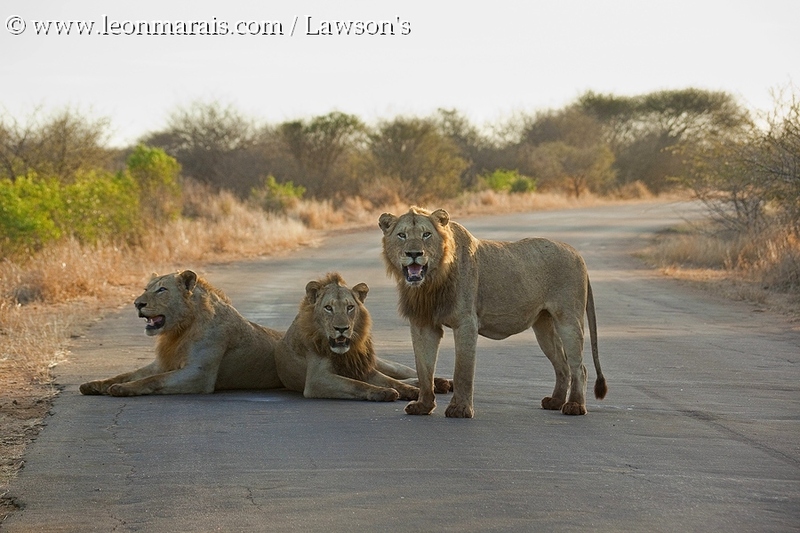 Not far south of the camp we saw what looked like a large liver lying next to the road, untouched by scavengers, and a bit further on found a pride of Lions with their two kills from the night – an unfortunate Buffalo cow and her calf. 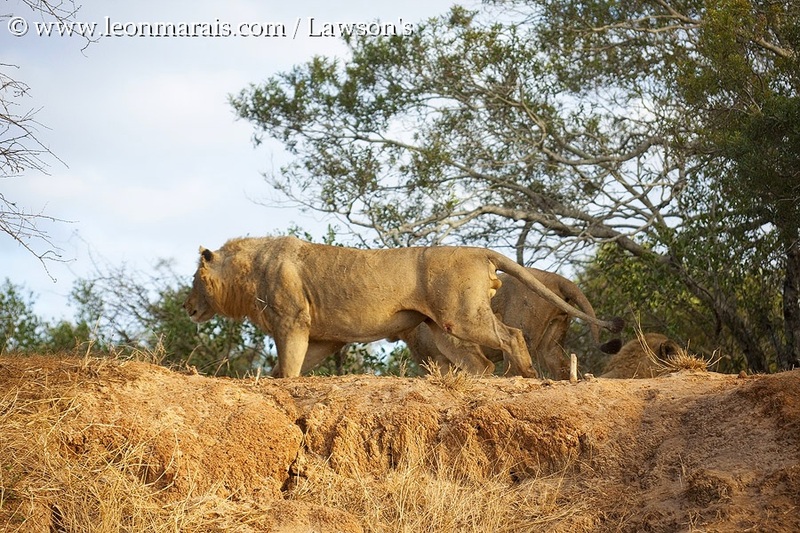 The cow had not been fed on at all, and one or two Lions were chewing on the remains of the calf, the rest of the pride already full-bellied and passed out in patches of growing shade all over the place. After much deliberation we worked out the route of the night drive and surmised that the ‘missing’ liver belonged to the Wildebeest that had been killed by the Lions (which they had seen on the night drive), and this was the same pride which had made a subsequent double kill of Buffalo cow and calf, and were thus too full to even start feeding on the Buffalo cow. Talk about making the most of things! Moving on we had to sit in a small traffic jam as the Sweni Pride were camped in the road just over the Sweni Bridge, and their position meant that no cars could get past and we basically had to wait until they moved off. But as is the random nature of game viewing, this put us on schedule for a series of wonderful highlights further down the road. 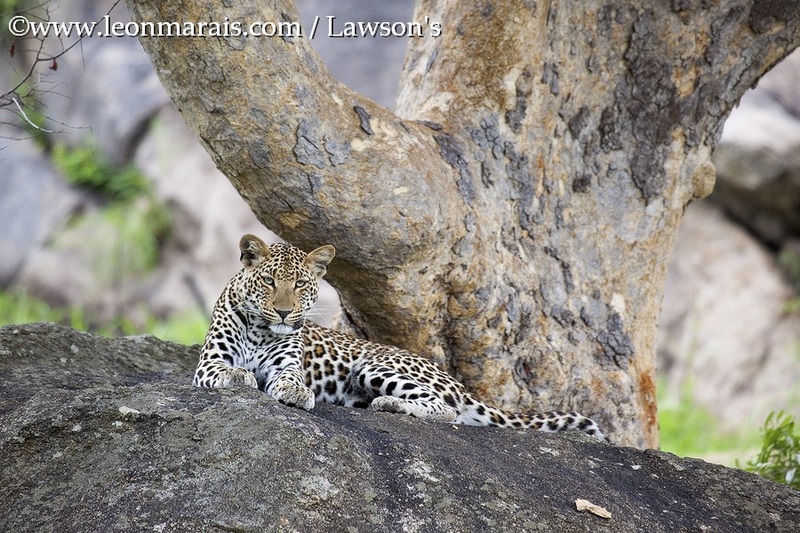 Next up was a large male Leopard walking through an open area a little distance from the road. The beauty of this time of the year is that the areas which were burned during September were by now covered in a carpet of short green grass, which attracts many grazers and makes for excellent visibility. With good binocular views we followed him for a while and then realised he was heading towards another road running perpendicular to the road we were on, and so went up ahead to set up an intercept for closer views. Parking on the slope to allow for maximum visibility we sat and waited in line with his projected path, only to see him pop out a little distance ahead of us at the junction, the sneaky bugger! But he was in no rush and we eased down to get right up next to him as he marked his territory and ambled along on his morning patrol. 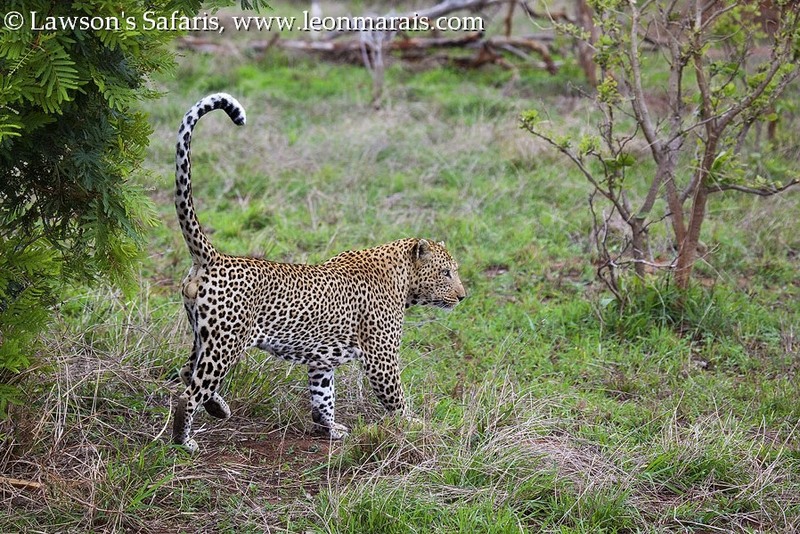 More than chuffed, we set off after he disappeared into the bush, wondering what we would encounter next. Our thoughts didn’t have too much time to develop however as we came across a female Cheetah and two cubs lying in the road, with no other cars in sight. Soon after we stopped they moved off into some sparse scrub on our right, and a most comical scene unfolded. Mr. Black Backed Jackal came trotting down the road towards us, so nonchalantly that we could picture him whistling a merry tune as he went. 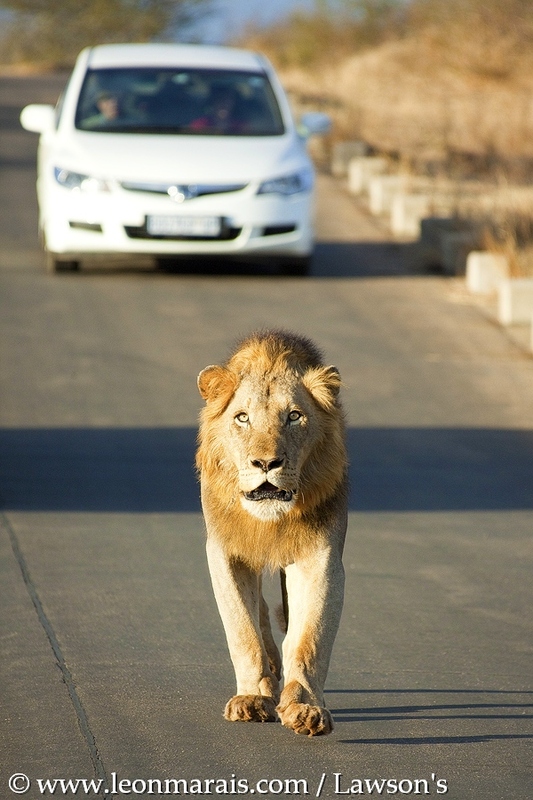 This did not go unnoticed by the Cheetahs, and when they saw him veer off the road towards them they set up a 3-point ambush. Straight into the ambush the Jackal trotted, only to look up and see three Cheetahs converging on him at full speed. The cats were just toying with him however, and with his nonchalance gone and a carefree morning put right out of his mind he was last seen disappearing at high speed straight back down the road he had wandered up. And so enthralling was this experience that afterwards we all realised that we had completely forgotten to take photographs of the Jackal chase, instead just enjoying the scene through our binoculars and leaving it burned into our grey matter. Next up was a lone Spotted Hyena and another Black-backed Jackal (partner of the victim of the Cheetah ‘attack’) scrapping over the remains of a Buffalo kill, with a Hooded Vulture looking on and the rest of the Buffalo herd grazing close by, unperturbed by the scavengers fighting over the remains of one of their brethren. By then it was time for coffee and breakfast at Tshokwane, and a chance to digest the three magical hours we had just experienced. Moving on we had a large White Rhino bull and a herd of Elephants having a bit of an altercation over the rights to a small pool of water, plus numerous other sights, scenes and sounds, before finally and somewhat unwillingly leaving the park via Phabeni Gate. 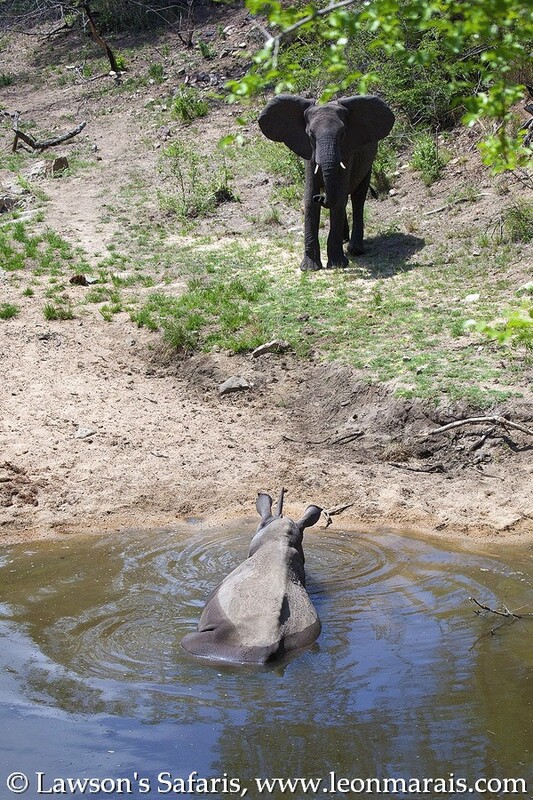 Well, all good things must come to an end, and one thing is for sure: you can never get enough of the Kruger National Park! Equipment review: Vortex Viper HD 10 x 42. 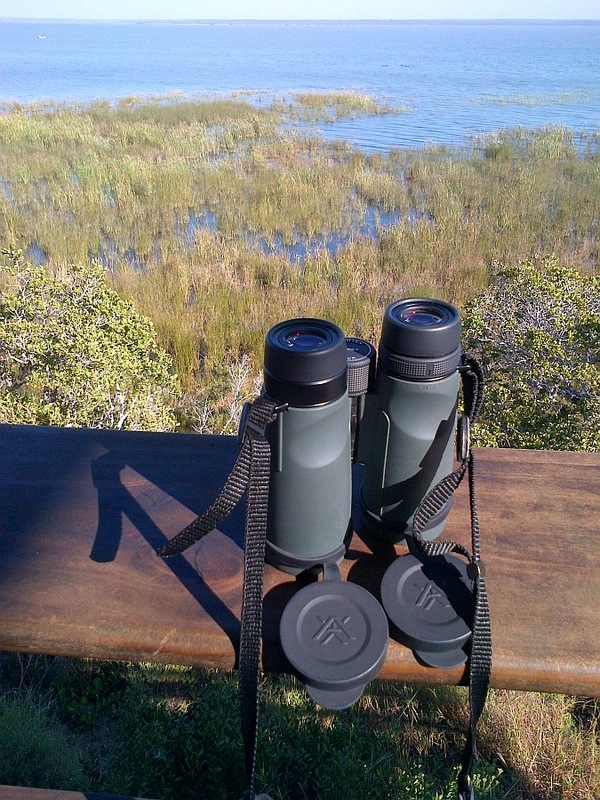 Kit review: Vortex Viper HD 10 X 42 Binoculars. I think that the big name, big price binocular manufacturers have some serious competition on their hands. 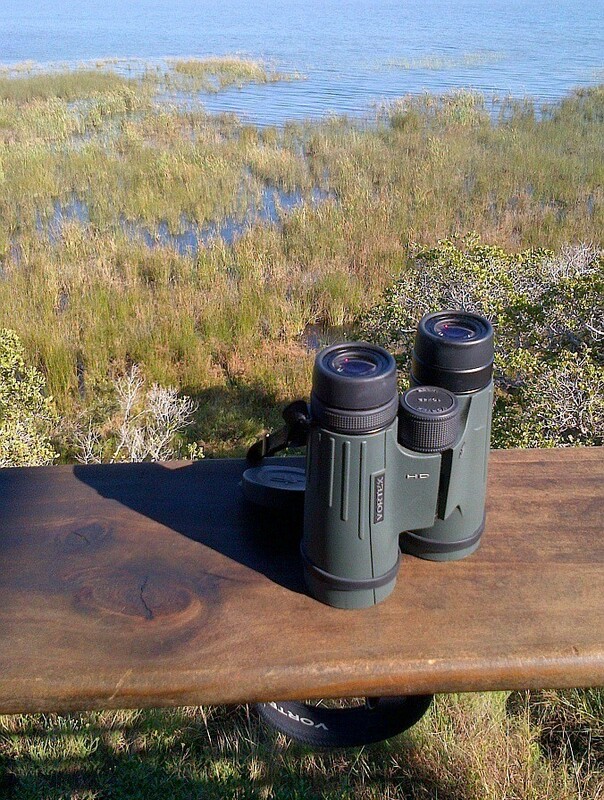 The middle range binoculars seem to be closing the gap, so it is now a valid question to ask: why pay three times as much when you aren’t necessarily getting a pair of binoculars that are three times better? Of course no one will argue that the big names such as Swarovski, Leica and Zeiss aren’t superb pieces of equipment, but does the price warrant the purchase? I recently got a pair of Vortex Viper HD 10 x 42’s, and am suitably impressed. Now the original argument was that the expensive binoculars came with lifetime warranties, whereas mid-range binoculars usually didn’t. But with the Vortex lifetime warranty, the gap closes even further. The Vortex Vipers are among the smallest of 10 x 42’s on the market, and certainly go easy on the neck and shoulders during a full day’s birding. They feel solid, the construction is good and the various elements have all the hi-tec requirements of a first-rate pair of binoculars. I’m not going to bore you with the specs, such as the BaK4 prisms and dielectric coatings, Aargon gas filling etc, as you can read all about that on the Vortex website, but I can say that these are great binoculars to use in the field. They come with a decent neck strap, rear-end caps and what I refer to as a rusk guard (the cover which prevents rusk / biscuit crumbs from collecting in the eye pieces when you are having your morning coffee break in the field), and basically are a real pleasure to use. See more at http://www.vortexoptics.com/product/vortex-viper-hd-10×42-binocular. 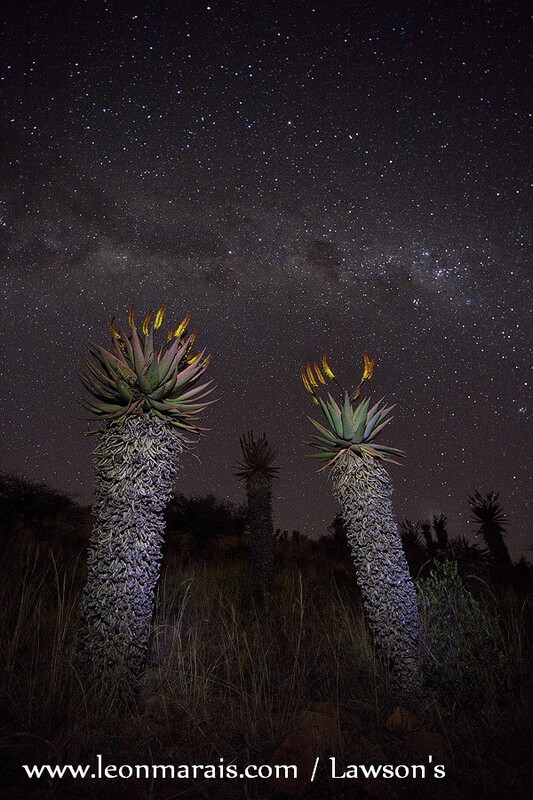 Photo of the Day: Aloe marlothii under the stars. A stand of Mountain Aloes under the southern night sky. Astrophotography has long been something that I wanted to get into, and in 2011 I started experimenting. I started without the right knowledge or equipment, then progressed to acquiring the knowledge but not the equipment (my crop-sensor Canon 550D just produced way too much noise at high ISO and my lens just wasn’t fast enough), and now, with my Canon 5D Mk 11 and 17 – 40 mm F4 lens, I finally have the ability to do the job properly (though of course a faster lens will be even better). Canon EOS 5D Mk 11. EF 17 – 40 MM f4/l USM. Photo of the Day: Martial Eagle, the Lion of the Bird World. 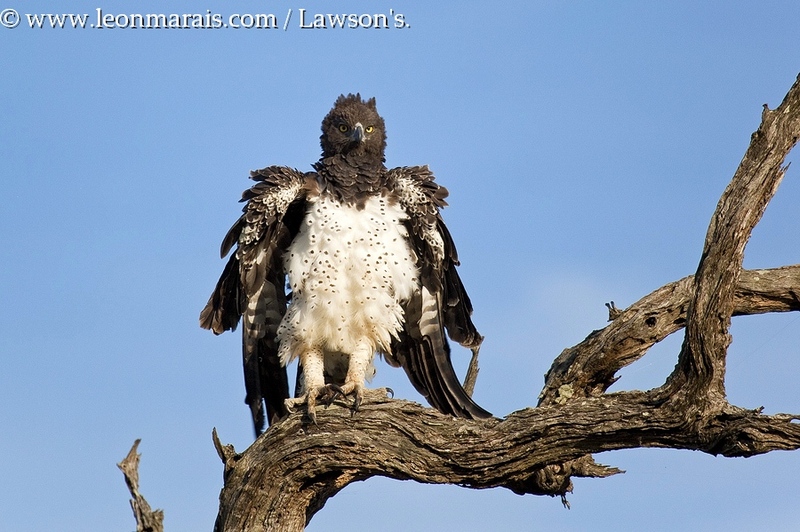 Photo of the day: Martial Eagle, Kruger National park, March 2014. We encountered this impressive raptor – the Lion of the Bird World – on our way northwards from Satara to Olifants Rest Camp one morning. Perched in a long-dead Leadwood Tree, which itself could have been here standing sentry over the grassy plains for hundreds of years after it died, the Martial was just beginning its day. Although the hour was dedicated to preening, one could note the intensity in its eye, telling you that a Monitor Lizard’s movement 500 meters away would not go unnoticed; a Guineafowl moving out of cover somewhere across the plain would be a marked bird. The dilemma for us involved that insatiable urge for better photographs. We all want that pin-sharp in-flight shot as the bird takes off, and by all means this was the moment for it: good light and an unobstructed view. Patience was the only critical point – how long do you sit and wait, holding a heavy lens up and anticipating flight at any moment? A shuffle of feathers (snap! ), defecation – is takeoff imminent? No, back to preening that one feather just so. Well, we eventually made the call to move on, somewhat reluctantly, and never once looking in the rear view mirror to see if it took off just after we left. 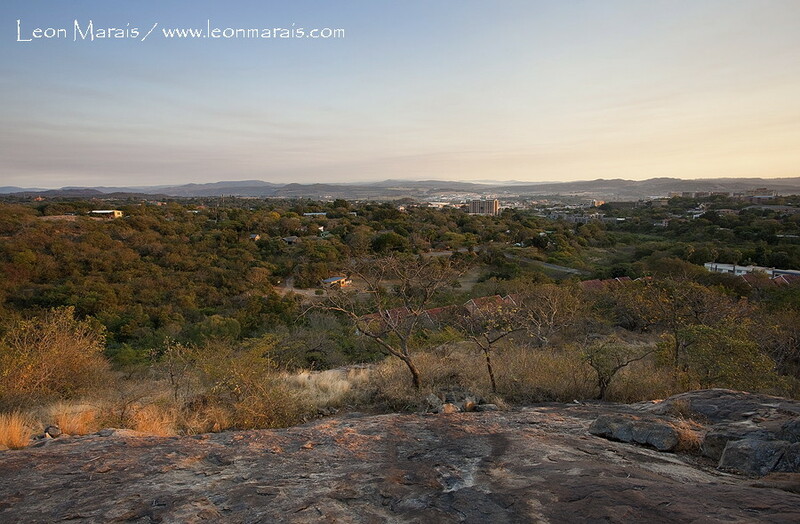 But the beauty of the Kruger is the unknown – a minute less here or there means a Leopard encounter up the road, and indeed, that’s exactly what happened. And that’s what keeps us rapt, the unpredictability of it all.